So in this historical post, the first ever edition of my new 'In a Nutshell' feature, I will be focusing on the life and times of everyone's favourite TV doctor (other than Hugh Laurie and Zach Braff, obviously): George Clooney. Why Clooney you ask? Of all of Hollywood and beyond, why him? Well, I had to start somewhere, and he was on TV just now, that's why. You can't get much bigger than George in Hollywood anyway. If the A-list was an actual list, surely Clooney would come 4th, behind only the King & Queen of America, Brad and Angie, and the one man travelling circus that is Johnny Depp. Which I suppose leads me to my first point about George Clooney: how the hell has he managed to get so bloody famous?! Don't get me wrong, I'm a fan. 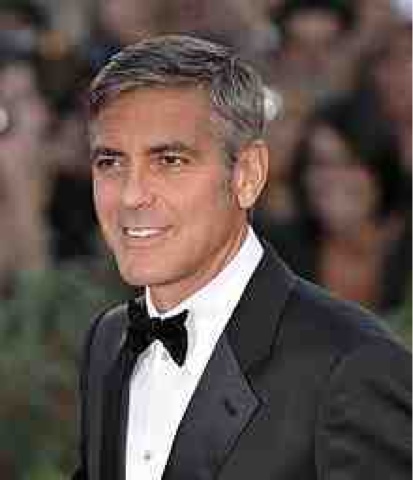 Clooney's got charisma to spare and undeniable leading man ability. But look at the films he's led. Both Pitt & Depp have a back-catalogue so rich that anyone could easily rattle off 14 or 15 great films they've starred in. With Clooney, you would do well to make it to double figures... That's including a trilogy too. Looking back at his career, a good rule of thumb for the Cloonster's track record is that for every great film, there's an eye-gouger. For every Syriana, there's a Solaris. For every Micheal Clayton, there's a Leatherheads. For every Ocean's 11, there's an Ocean's 13. So George Clooney's CV may not measure up to his monster fame, but a sudden resurgence has recently grasp hold of his career. A Clooney renaissance. If it is true - and a lot people would say it is - that Clooney coasted to fame on his good looks and charm, he's certainly earning it now. Starting in 2008 with the Coen bro's Burn After Reading, Clooney has been on an unbelievable streak, each film being drastically different but arguably even better than the last. From the uplifting rom com Up in the Air, to the unexpectedly awesome Fantastic Mr. Fox. Following those up with a high octane action/thriller double bill with The American and The Ides of March. A staggering run of greatness, and how does he cap it off? With a Golden Globe win and Oscar nomination for his role in The Descendants, his best performance to date. So, there you have it. George Clooney: the man who started in ER and some how managed to smouldered his way to the top. Now he's there though, he's certainly doing the right thing to ensure he stays there.